What I ate today? Raw Vegan and Low Fat? In the morning I drunk 600ml of warm water. 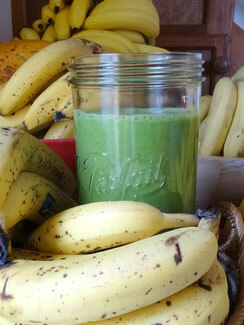 Then before my elliptical bike session, I made some green juice for both of us. I'm not absolutely juice person, we found that whole food is always better, but at this time of a year we have lots of greens on the market: carrot tops, kohlrabi leaves, beetroot greens, etc... They sell all spring vegetables with their leaves, so I'm using them in the juice. It's packed with nutrition and easy to prepare with a high speed juicer (slow juicers don't manage hard stems as well, carrot tops for example). I was using a Slow Star juicer for many years and it's the best vertical, I've ever used, but then I wanted to try the difference with a good high speed juicer. I got some small and easy-clean Phillips and it's WONDERFUL! 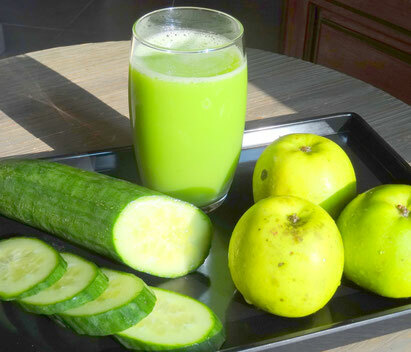 No more cutting, no more pushing, etc... For green juices it's excellent. For fruit juices, which I don't recommend anyway, it's better to use vertical slow juicer. Push everything through you juicer and enjoy! We shared the juice together. After my workout routine, I took some small papaya (about 1 kg). Soon after it was already a lunch time and I had a big green smoothie with lot's of spinach, barley grass juice powder and 6 large ripe spotty bananas. It was delicious, we had a chance to have good box of bananas (it's not always the case). In the afternoon I had I more small papaya and 2 big oranges. 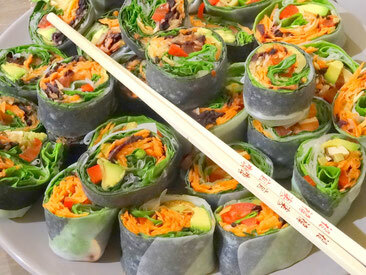 Rice paper sheet and half nori sheet filled with carrots, zucchini, batavia salad, spinach leaves, mint leaves, parsley, green onion, tomato, red belle pepper and a small piece of avocado. I had 5 of these. Yes, I had all that! We finished our day with some herbal hot tea: fresh rosemary from the garden, a slice of ginger root and a slice of lemon, hmmm excellent. Don't miss any new recipe, join our mailing list here. Experimental writing is any composition that goes outside the limits of ordinary expert, journalistic, scholastic, or specialized types of writing, ordinarily recognized by an accentuation on story create, character improvement, and the utilization of abstract tropes or with different conventions of verse and poetics.Other courses will focus on enhancing your written work with no respect to whether the composition is to be considered for production or not. Most experimental writing courses will incorporate guidance on the best way to compose fiction, verifiable and verse.